A crisp, clean aroma of freshly picked carnation flowers. Carnation has a strong, herbal aroma that carries floral notes that tend to linger. 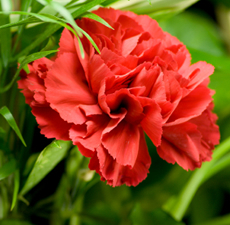 Carnation is valued as a fantastic aphrodisiac, as well as a spiritually uplifting, motivating oil. Carnation Absolute can be used in soaps, candles, potpourri, room fresheners, and in massage therapy applications. Carnation has an extensive history of use in the perfume industry, and unfortunately, of being adulterated. Carnation should not be used on broken or irritated skin.